The Life Science Park is an impressive three-building complex with a total floor space of 20,000 sq m and infrastructure intended for businesses and researchers engaged in the development of life sciences. The Park’s infrastructure primarily comprises specialized laboratory space and office space to rent. The owner and administrator is the Jagiellonian Center of Innovation, a company established in 2004 by the Jagiellonian University in Krakow. The Park has been designed in such a way as to allow for its infrastructure to be adapted to suit any activity in the field of biotechnology, biomedicine, biology, chemistry, pharmacology, physics, nanotechnology, and environmental protection. In addition to space flexibility, the design of the Park includes solutions facilitating life science activities, such as modular space, increased floor load bearing capacity, a water mist fire protection system, laboratory air change rate up to 22 cycles as well as additional service ducts allowing for the extension of wiring and plumbing systems. The laboratory space is integrated with shared areas that form complementary facilities for Park tenants: meeting rooms, modern conference rooms as well as amenities and technical facilities. In the Park there are also a kindergarten, an electronic library, a fitness club, and a sauna. A portion of the Park’s laboratory and office facilities is used by the Jagiellonian Center of Innovation to provide, amongst others, contract research services and clinical trial services as well as cosmetics testing and production services. Building “A” with a total space of 5,890 sq m is intended for commercial lease to life science companies. The laboratory space can be adapted to suit individual customers’ needs, also in terms of requirement for specialized laboratory equipment. Building “C” complements the services offered in building “A”. The laboratory space available there is 6,300 sq m.
Building “B” provides space for the provision of services as part of the “Incubator” program and is intended for lease to research projects and small-sized life science firms. Unlike the other buildings in the Park, it has laboratories and offices ready for use. 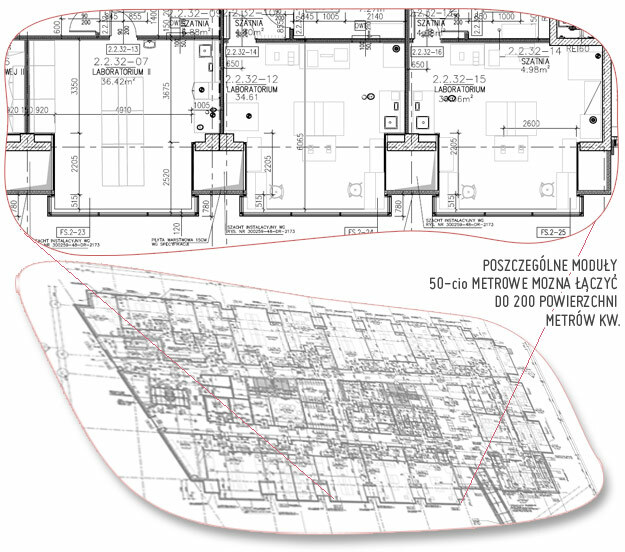 In Building “B”, laboratory space is subdivided into 50-meter modules. The areas are equipped with basic laboratory equipment. The total area of the Incubator is ca. 6,800 sq m, and the laboratories account for 1,770 sq m of that total floor space.